Paris, 27th March 2012 – Groupe GM, a global leader in hospitality products, today announced a worldwide exclusive partnership with leading international spa brand Kerstin Florian, to deliver a new range of naturally-sourced hotel amenities to hotels and resorts all over the world. This partnership will deliver a line based around their spa products, focused on the philosophy of outer beauty, inner health. “With guests today demanding a relaxing, refreshing hotel experience, this exclusive alliance with Kerstin Florian allows us to offer hotels and resorts a hospitality range that is focused entirely on the well-being, and revival of its clientele” commented Laurent Marchand, President of Groupe GM. Kerstin Florian exclusive spa products seek to inspire a sense of well-being and core to this exclusive new hotel amenity line is the use of Neroli, the fragrant white blossom from the Bitter Orange tree, a scent considered to be one of aromatherapy’s most effective stress relievers. All of the products are infused with this refreshingly clean scent to help hotel guests balance the body, uplift the spirit and calm the mind. 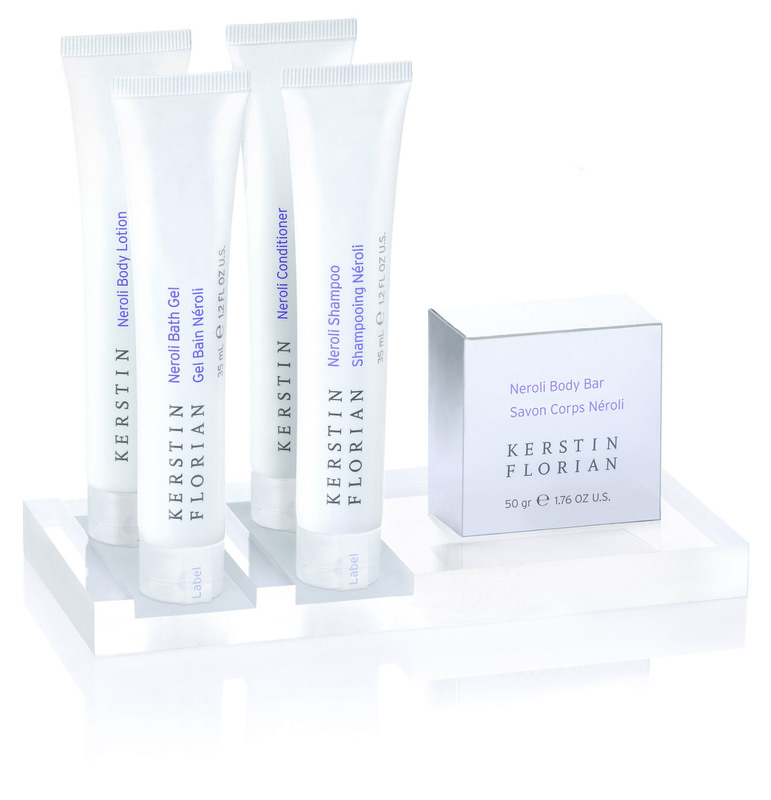 Drawing on its Swedish origin, natural wellness is the main inspiration behind the Kerstin Florian range. Each spa product is derived of naturally-sourced ingredients, refined through research and technology to deliver beautiful results to the client. Through this new hotel amenity line Groupe GM and Kerstin Florian offer luxury spa-inspired products to hotels and resorts keen to contribute to the everyday welfare of their busy clientele. «Kerstin Florian spa products and treatments are well known across the international spa sector for their commitment to an authentic approach to well-being, beauty and a healthy lifestyle. Working with Groupe GM, this new line of amenities allows us to bring the Kerstin Florian experience from the spa directly to the hotel room”, adds Charlene Florian, VP, Corporate Creative Development at Kerstin Florian. • They have been tested under dermatological control. • They do not contain any ingredients of animal origin and have not been tested on animals. • The Kerstin Florian hotel amenities are infused with an uplifting Neroli scent, one of aromatherapy’s most effective stress relievers. • A streamlined presentation tray (172 x 80 x 15 mm) enhances the line elegantly. Kerstin Florian International (KFI) develops and manufactures a progressive range of European facial, body and bath products and treatments for the spa industry based on natural resources including thermal mineral water, mud, algae, herbal extracts and essential oils. The family-run company is based in Lake Forest, California, U.S.A. and was founded in 1978 by Swedish-born Kerstin Florian, a spa expert with over 40 years of experience in the industry. The company produces over 100 professional and retail products and over 25 treatments, encompassing exclusive facial, body, bath and sun treatments as well as manicures and pedicures. 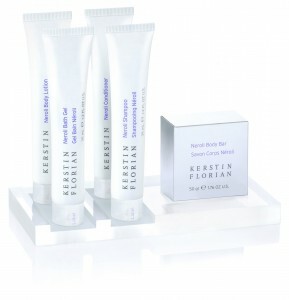 Kerstin Florian sources throughout the world to obtain the highest quality ingredients available. KFI is an international company with distribution offices in Europe, Canada and Asia.